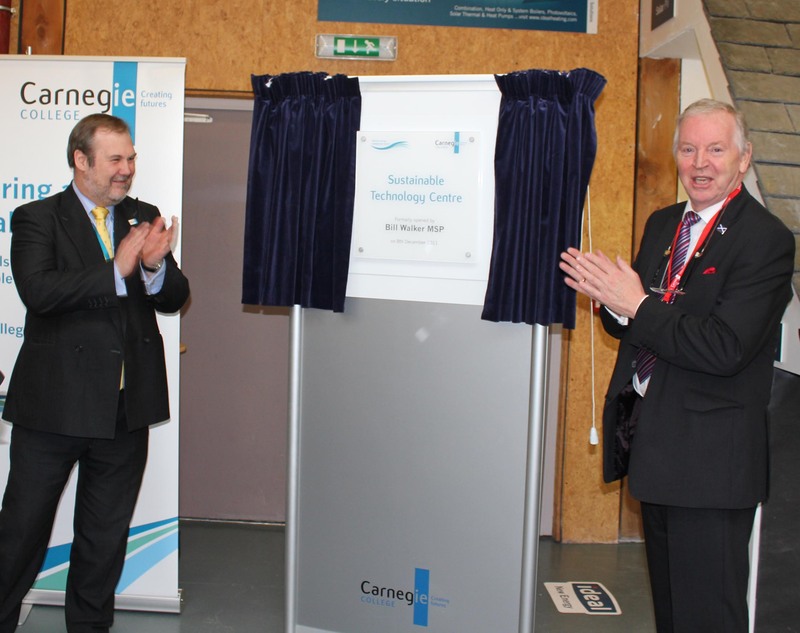 Carnegie College’s latest training centre for sustainable construction and micro-renewable technologies was officially opened by Bill Walker MSP on Thursday 8 December. The new Centre at the College’s Halbeath campus extends the training available for the renewables industry provided at the Whitlock Energy Collaboration Centre. Working in partnership with industry leaders Ideal, Ubbink and the Scottish Passive House Centre, Carnegie’s Sustainable Technology Centre is home to the latest technology and equipment, and will initially offer BPEC accredited courses for the installation and maintenance of solar photovoltaic PV systems, solar thermal hot water systems, under-floor heating, ground and air source heat pumps and smart metering. Jim Brown, Head of the Whitlock Energy Collaboration Centre, explained the ethos behind this new centre. “This new Centre demonstrates Carnegie’s commitment to ensuring organisations receive up to the minute training to allow them to take advantage of the new business opportunities that are becoming available in the sustainable micro-renewable sector. For more information regarding these and other courses on offer, call 0844 248 0115 or email info@carnegiecollege.ac.uk.